Dr Jones & Partners Injury Update: R13 GM of High Performance Matt Hass updates us on Luke Brown after Sunday's loss to Fremantle. Experienced Crows Rory Laird and Tom Lynch both face fitness tests ahead of selection for Saturday night’s game against Hawthorn. Laird and Lynch, who are recovering from a fractured hand and side strain respectively, will need to impress at Thursday’s main training. 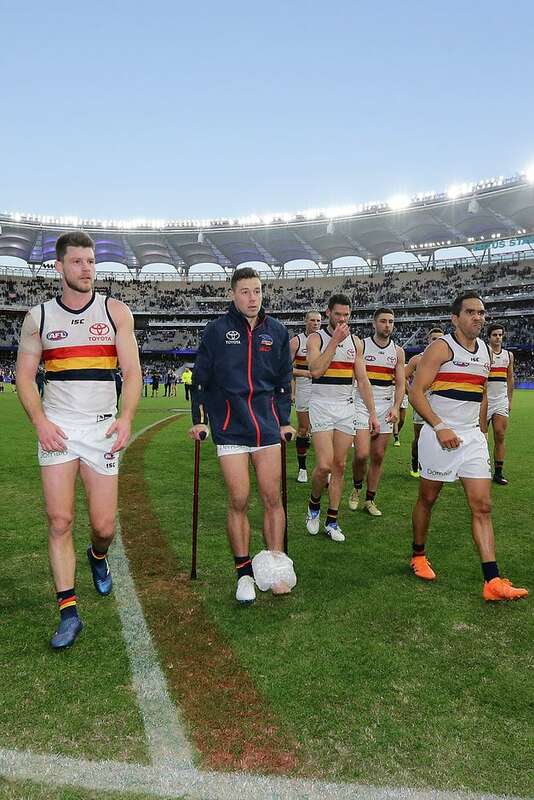 Crows General Manager High Performance Matt Hass said Laird looked to have improved over the weekend. “Lairdy has taken a little bit longer to settle with his ball-take but we are continuing to build his training loads,” Hass said. “Very similar for Lynchy, his side strain is settling down. Defender Luke Brown will have scans on his injured ankle suffered on Sunday and is unlikely to play against the Hawks. “Unfortunately for Browny, he rolled his ankle in a marking contest late in the fourth quarter,” Hass said. “Obviously he was pretty sore, we had him iced and on crutches. Harry Dear didn’t play in the Club’s Round 10 State League loss to the Eagles because of knee soreness and will require further assessment. In positive news, Rory Sloane is on-track to return after the Club’s Round 14 bye as he recovers from a strain to his lisfranc ligament.